Honestly, this is a great showing of work. Check it out if you have time. 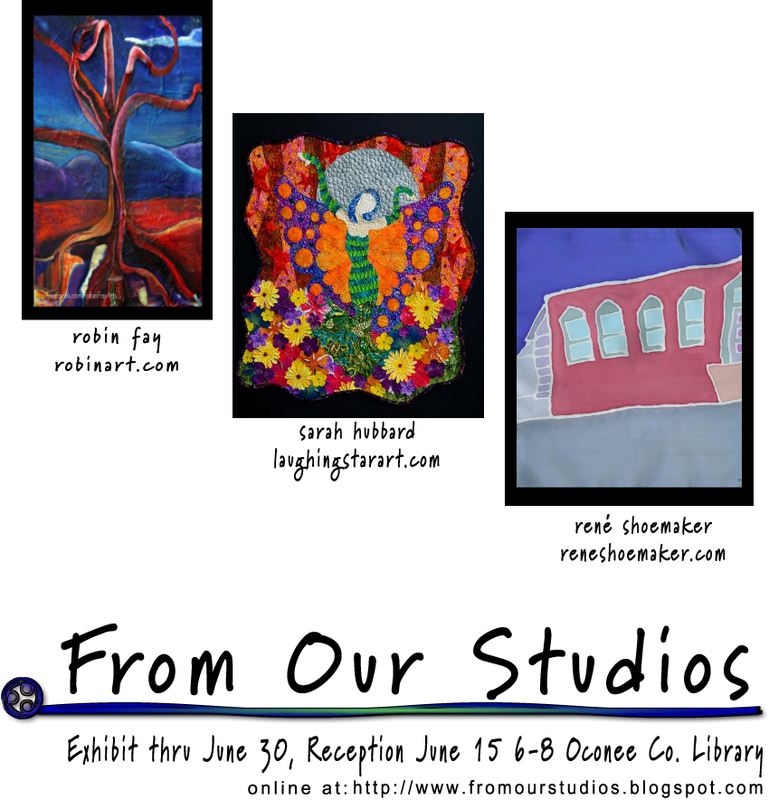 Reception June 15 6-8 p.m. Oconee County Library. 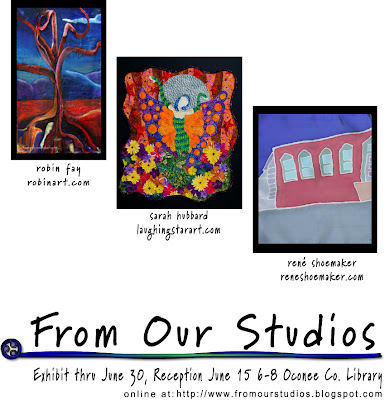 Featuring work from robin fay (me), sarah hubbard & rene shoemaker. Tuesday June 21st at 7:00 pm in the new middle school cafeteria is your chance to tell community leaders your vision for Oglethorpe County and Cities future. Come tell us what you think and hear from your friends and neighbors. Kind of nice to see that the UGA Art School programs are so highly rated (U.S. Report). My intent was to see how schools are ranked and what schools to recommend to him. It is a really good source. Print making, painting and drawing, photo and ceramics fair well as well. The Festival of American Chamber Music will have concerts at the Ramsey Recital Hall at the UGA Performing Arts Center May 20, 21 and 22. You can see the event descriptions and times at https://sites.google.com/site/americanchamberfestival/. Anyhow, I wish them great success and I really hope they share their content beyond their target audience. If you are interested in community folks, art & more, check out the site. Perhaps, someone will even consider crossposting or sharing their information here at athensworld. Marigold Festival - 5k, parade, music, arts & crafts! marigold festival featuring musicians, crafts, entertainment & $10/bag book sale at the Front Porch Bookstore May 21, 2011. May 21, 2011 @ 8:00 a.m. This event will take place in the City of Winterville, at 8 a.m. on May 21. The starting line will be located in the city square. You will also be able to pick up your race number and retrieve your t-shirt from the Pittard Park Pavilion. In order to insure that you are given the appropriate size t-shirt, please indicate your size below. The 5k Fun Run/Walk will come at the beginning of Winterville's Marigold Festival. Join us for our annual Mule Day farm celebration! As in years past, we will host our favorite craftspeople and artisans who will demonstrate basket-making, quilting, soap-making and blacksmithing. This year will feature some new guests from Georgia Mudcats Pottery who will bring their work (including face jugs) to share and sell. The Georgia Old Time Plow Club will demonstrate plowing with mules and oxen and wagon rides will be available for anyone who wants a ride down the road or up to the schoolhouse. Local barbecue will be cooked and served onsite along with several sweet treats to the accompaniment of bluegrass and gospel music. This restaurant has the best falafel I have ever eaten. This stuff is so good that I don't even see the point of trying the other menu items. I would recommend you check this out, and it is located at 1074 Baxter Street in what is obviously an old Pizza Hut building. I am not even the type of person to explore much international or vegetarian fare, but the falafel is spicy and satisfying. Here is a story from Online Athens last year about the place. Join us for the opening of a one-of-a-kind exhibit featuring never before exhibited materials highlighting Margaret Mitchell's life during the writing of Gone With the Wind and in the days leading up to its publication. Seminars and Documentary ScreeningA variety of authors and experts will discuss Margaret Mitchell, Gone With the Wind, and its impact on literature and the world at large. On hand will be John Wiley, considered by many to be an expert on Margaret Mitchell and Gone With the Wind, to discuss his new book, noted Gone With the Wind memorabilia collector and author Herb Bridges, UGA's Albert B. Saye Professor of History Dr. John Inscoe, and others. We will be screening Change in the Wind;, the latest documentary from Emmy-winning filmmaker C.B. Hackworth, who along with Mary Taylor, former director of the Margaret Mitchell House and Museum will dicuss the never before seen aspect of Mitchell's life uncovered in the documentary. Following a break for dinner, we will be treated to a performance of Mrs. Marsh, a one-woman play written by Melita Easters based on the letters of Margaret Mitchell. Please contact Leandra Nessel at (706) 542-3879 or lnessel@uga.edu for more details and a timeline of events!